When their son got burned, they wrapped him in rags and let him “rest.” One year later, police were shocked when they saw his body. In 2011, there was a terrible fire in the city Munkatch in western Ukraine. The blaze swept through an entire street and destroyed several buildings, yet amazingly no one was injured by the flames. At least that's what the authorities thought until they found out the horrible truth. About one year after the fire, the city's social services department received an alarming tip: a neighbor reported that there was a seven-year-old on her street who needed urgent medical attention and was being neglected by his family. Police and social workers went to investigate the allegations, but they couldn't have expected what they were to find. They found the boy with severe burn wounds covering his entire body. To make matters worse, the injuries were quite old and had been wrapped in dirty rags. It turned out that little Ihor Lakatosh had actually been burned in the fire that had raged through the street one year earlier. Approximately 30% of his skin was badly burned and had never been properly treated. Instead of bringing him to the hospital, Ihor's parents had simply covered the wounds with dirty cloths and laid him in bed to "rest." The pain must have been unbearable, and Ihor had to spend months curled up on his bed unable to move. He had lain in this position for so long that his spine had actually deformed and his right arm had grown attached to his torso. The fact that the boy was still alive was something of a miracle. Social workers immediately brought Ihor to the hospital while the police questioned his parents. No one could understand how they could have ignored their son's pain for so long. Facing charges of child abuse, Ihor's parents fled from the authorities, leaving their son behind. Surprisingly, Ihor wasn't sad that his parents were gone. In fact, he was actually happy to be free of them. 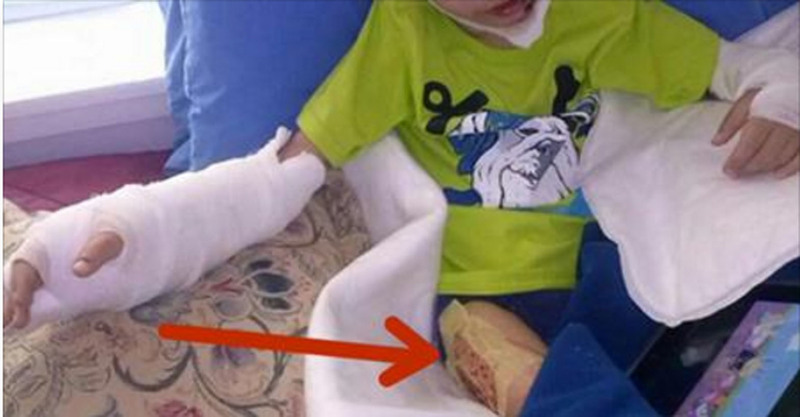 In the hospital, the young boy finally received the medical treatment that he so badly needed. Doctors were able to detach his hand from his torso and were amazed at how full of life and determination little Ihor was. Bogdan Kikina, the manager of the local orphanage, couldn't hold back his tears when he saw Ihor for the first time. The boy was very weak and small for his age, weighing only 30 pounds. But Bogdan could also see that there was a strong will to live in that tiny body, and he vowed to do everything he possibly could to help the boy. Bogdan treated Ihor like a son and made it his mission to give Ihor a fighting chance at a normal life. He contacted everyone he knew and asked the national media to help him find the best experts in the Ukraine who could help to treat Ihor's injuries. A few months later, his efforts paid off: Ihor was invited to the Shriners Hospital for Children in Boston. The treatment and care that Ihor received in Boston allowed him to thrive and become a healthy young boy once more. Over a period of three years he underwent almost 20 operations. Yet no matter how much pain he was in, he never let it get him down. After all that time he had spent unable to move, he was anxious to take every opportunity to run around, play and sing like all other children his age. Ihor is now 11 years old and his horrible experiences have attracted a lot of attention and made him something of a celebrity. He now travels the world to share his story with others and he does that mostly in English, a language he has learned very well. Ihor still faces a few operations, but there's no doubt that he'll get through them just fine. The little fighter has already been through hell and as far as he's concerned, nothing can stop him now. What a brave boy! His will to live and determination are an inspiration for us all.